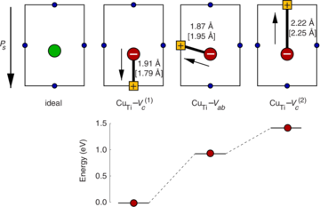 Thermodynamic, structural, and electronic properties of isolated copper and iron atoms as well as their complexes with oxygen vacancies in tetragonal lead titanate are investigated by means of first principles calculations. Both dopants exhibit a strong chemical driving force for the formation of MTi-VO (M=Cu,Fe) defect associates. The most stable configurations correspond to a local dipole aligned along the tetragonal axis parallel to the spontaneous polarization. Local spin moments are obtained and the calculated spin densities are discussed. The calculations provide a simple and consistent explanation for the experimental findings. 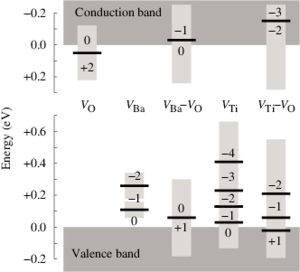 The results are discussed in the context of models for degradation of ferroelectric materials.